THIS IS A DEVELOPING STORY. AN EARTHQUAKE with a magnitude of 7.4 hit Japan, and a Tsunami reaches Eastern Japan. Call for evacuation of the area. 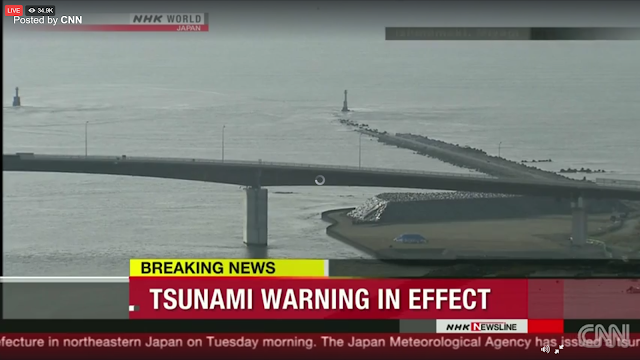 "3 meter tsunami waves is expected to hit" says local TV in #Japan. 1.40 meter waves have been observed after a 7.4 earthquake magnitude. Tsunami waves arrive along the Fukushima coast. The tide level is still rising along the coast, with waves as high as 1m now reaching the shore. Residents are being instructed to stay away from the water. There are warnings that second and subsequent waves can be higher than the initial tsnuami waves. The Japan Meteorological Agency said the magnitude 7.3 quake struck around 6 a.m at a depth of 6 miles. The U.S. Geological Survey measured the magnitude at 6.9. The earthquake shook buildings in Tokyo, 240 kilometers southwest of the epicenter. A tsunami of at least 3 feet was observed in the city of Soma Port in the city of Soma nearly an hour late, Japanese public broadcaster NHK reported. Firefighting officials in the city of Iwaki told NHK a fire broke out at a petrochemical complex in the district of Nishikimachi, but they have extinguished it. A municipal official in the city told NHK so far, there have been no reports of damage from the quake in Iwaki, or changes to the sea level according to their observation by cameras.